This blade is made from black stainless steel with a partially serrated back. 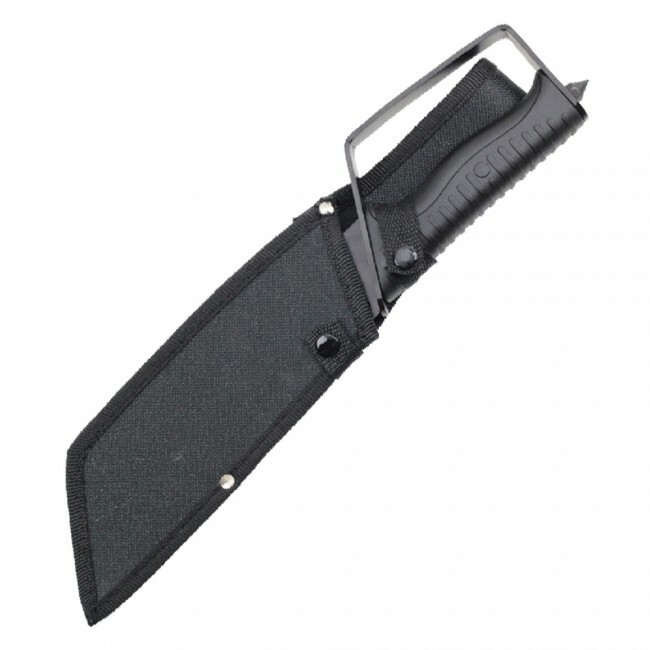 It features a tough plastic handle with a comfortable and safe grip with knuckle guard. The handle also features a sharp metal stud. Your knife includes a nylon sheath for storing your blade. A Fantasy Knife, but with all the right attributes! I bought the "Zombie Amputator" knife because I like the design. The blade is well made! It it heavier steal gauge than most blades that I've purchased. It has just the right blade length with an awesome slash and thrust design. Not to mention the steel fist guard and the break impact point at the base. I consider this blade a good asset to any arsenal or blade collection.